Tremendous Nutrition, Tremendous Taste. Dairy-Free, Gluten-Free. Does not contain hydrogenated fats, white flour or white sugar. 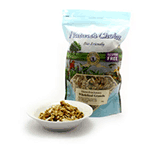 We use just the best natural ingredients in creating this delicious crunchy breakfast wonder-food for your enjoyment. A carefully selection of flaked and puffed rice, coconut, sunflower and sesame seeds and cashew chips are slow-roasted and then tossed with plump raisins to bring you a breakfast cereal that provides all the nutrients you need to get your day started. Enjoy Luxury GF Granola with the milk of your choice or sprinkle over fruit salad for that extra crunch.